Pizza Topped With Chicken, Mozzarella Cheese, And Our Special Barbecue Sauce. Galloway Only Order Online Here! Family owned and operated since 1985, at Primo Pizza we use ingredients of the finest quality and freshness that can't be beat. Our dough is made fresh daily on the premises. 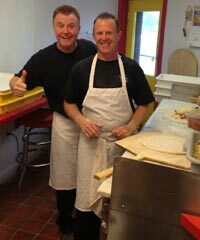 Primo Pizza is hand-tossed and made with pure mozzarella cheese, not a cheap imitation. Don't forget about our cheese steaks. The steak we use is the best available on the market. No gristle to work through, just tender beef. If you haven't had the opportunity to try our products, be sure to stop in and taste for yourself!